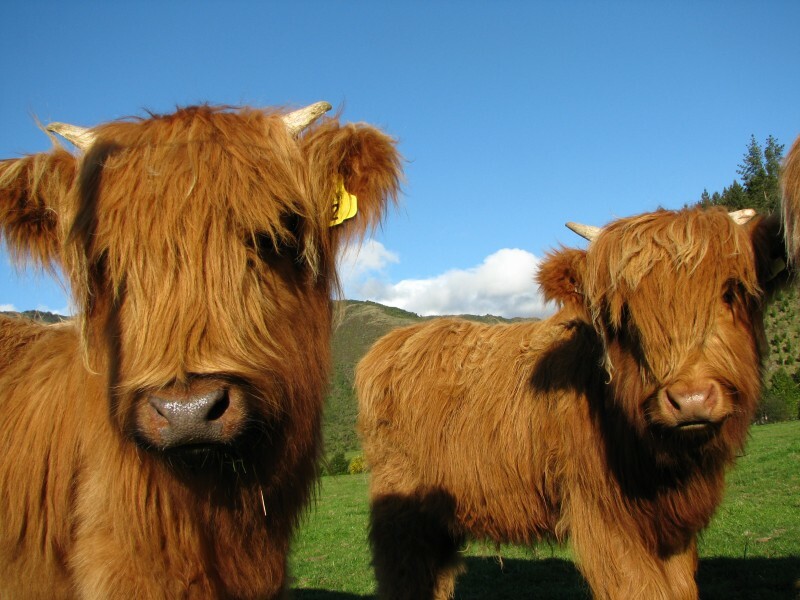 ARE YOU LOOKING FOR FRIENDLY, QUALITY HIGHLANDS THAT COME WITH BACKUP AND SUPPORT? WOOLLY MANOR MOOS is a SCOTTISH HIGHLAND CATTLE STUD that provides the lifestyle block market and breeders alike with High quality, Docile and halter trained animals. 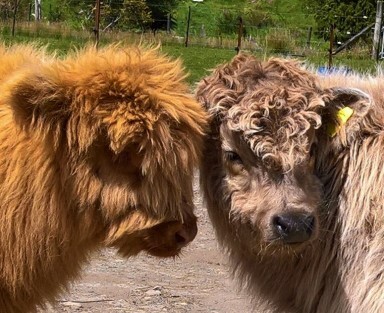 Our Highland Cattle are all breed with this being the most important attribute to all progeny, and we spend time daily with our Highland Fold to achieve this. All our calf’s are halter trained, this shows their true temperament and allows us to match the right calf with the right “Forever Home”. Our breeding animals at WOOLLY MANOR MOOS are all registered with a Royal affiliated Herdbook. 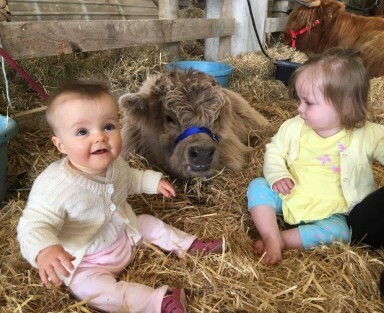 All our animals are handpicked for temperament from Fullblood or Purebred lines, including the calf’s breed for WOOLLY MANOR MOOS. We do not sell crossbreeds. Woolly Manor Moos does not just “take your money and run”. 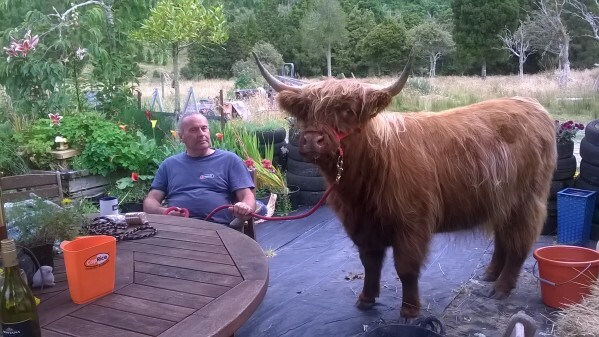 As most of our clients are lifestyle block owners often they are new to large animal’s. 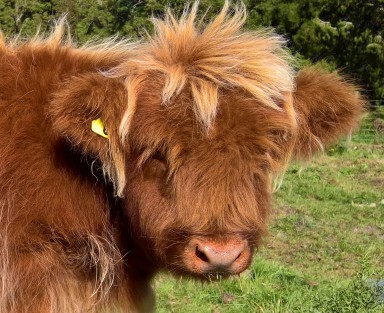 WOOLLY MANOR MOOS offer “sales and purchase” agreements and all hairy coos come with a “owner’s manual” as with all our Highlands sold we are always just a phone call away to assist and advise in farm management and all things moo. As most of you will know Woolly Manor Moos has really been grabbing the Bull by the horns so to speak in the last few months. 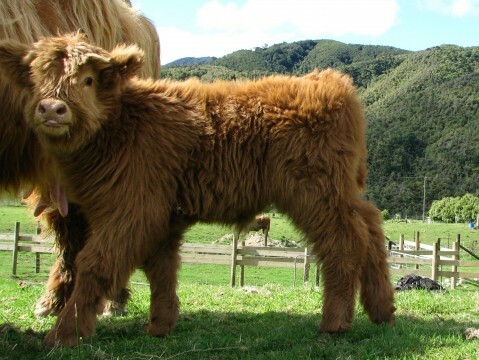 As part of our target to raise the profile of highlands we decided early on we needed to be in the show ring. 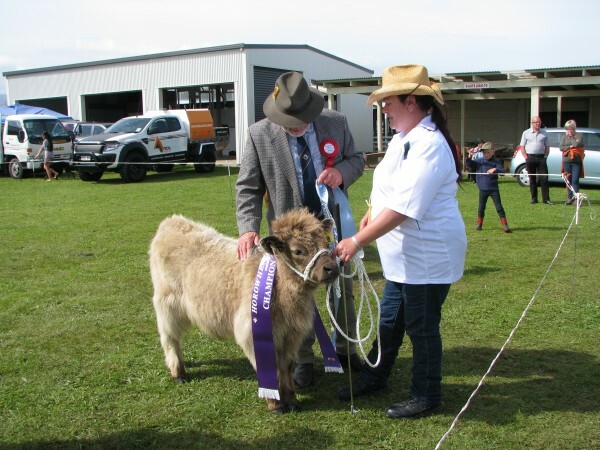 We haven’t showed before and so after 10 + years of breeding we have travelled to and successfully competed in 4 shows in the lower North Island, with our last on Saturday 18th Feb, so I thought as we have now done our first season it was time to share some of our experiences and some of the more highs than lows along the way. Our First experience was the Carterton Showgrounds Clareville in the Wairarapa October 2016, 3 hours drive away with float. Highlands had not been seen there for several years so we were somewhat apprehensive as to how we would be received. We had 5 beautiful yearling heifer’s that we had brought in and Schooled, 4 to sell on we called the 4 C’s as their names all started with the letter C and a beautiful girl called Etta James we had brought in to diversify our bloodlines and as a show animoo. I was very excited about this adventure and decided to show all 5, “how hard could it be”!! 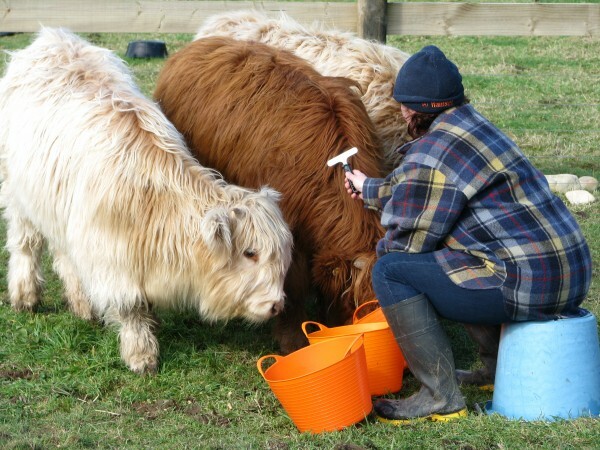 I can assure you that prepping 5 yearling highlands for show is a lot of work. Then 2 weeks before show we ended up with a bottle baby from one of our cows. – lets now make that six to take to show! Thankfully we have a very large float, which is a work in progress, but functional. The rain bucketed down in the days leading up to show and I was now about to have an anxiety attack that our road wouldn’t be passable as there had been roading crews working all week clearing continual slips. We had a friend of the family offer us grazing right next to the show grounds and mum lives 5 minutes down the road, so we had already decided to go the day before so the girls could settle into a new environment before the show. On the Friday, we awoke to beautiful sunshine, Pete went and checked the road for access and we were “Thunderbirds are Go”! The float and car was already packed with what I thought we would need minus kitchen sink – just! and I started to bath the girls, I would wash – Pete would towel dry and we would then do all the primping once we got there. By the time we got to the 3rd girl the skies closed over and the rain started to pour. So 6 animoo’s were very quickly loaded onto the magic box and we got out before the road closed. We arrived in Carterton 3 hours later to clear skies and sunshine. The girls and bull calf Monty travelled well and managed not to Pooh on each other! We finished the bathing and primping regime and went to have a look at the showgrounds. We arrived to get the girls and Monty early on Saturday and transported them the 2 mins down the road to the venue. Clareville is a fantastic venue, a huge indoor area to house the animals and nice showrings just outside. We were very successful with x2 3rd places, a first and a champion! Even little Monty now 2.5 weeks old (after show officials encouraged us to enter him) came 2nd – the Dairy classes even stopped to come and watch him! Everyone was amazing and so supportive, and we were even invited to show at Masterton and Dannevirke by some of their officials. I would Highly recommend Clareville to anyone wanting to show whether you are new to showing or not, it was a fantastic experience! We even made it into 2 Wairapa newspapers so we were clearly doing something right. Out next Show was Levin January 2017 this was the start of 3 shows over 6 weeks. Four of our yearlings were now in their new homes and I really wanted to have another show animoo. In early December I went back to the breeder I had brought Etta James from and purchased a very striking 2-year-old Heifer called Edith. She had very little human contact as the breeder was finding it hard to get the time, and hence were downsizing. 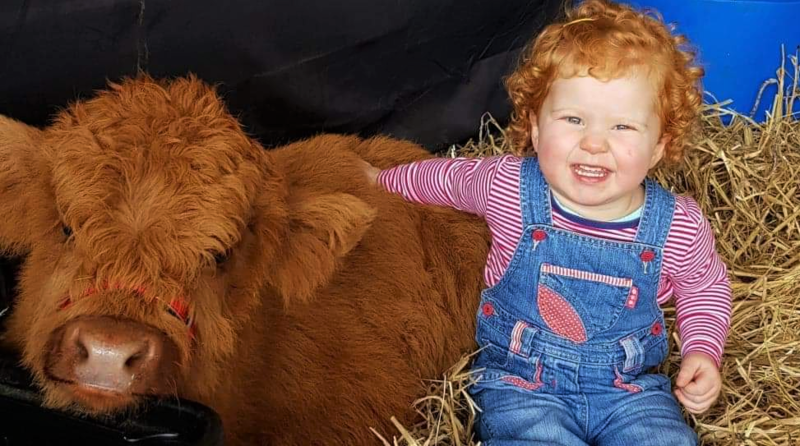 I had 6 weeks until show to get a 2 yr. old trained –I’m actually pretty good at training and the judge at Clareville had commented on how quiet our animals were so how hard could it be to train a 2 year old!!! Most people I told about this thought I had either bitten off more than I could chew or I really was nuts! Etta James, Monty and the 2 steers slept like the dead all night, Edith bellowed most of the evening and found a couple of Santa Gertrudis who also liked to bellow. It was an amazing night sleeping in the stall’s - Cows Bellowing (Edith and her new friends were like a teenage girl sleepover), Monty Farting, Pigs two sheds down squealing and somebody snoring meant I probably had half an hour sleep. But with the exception of Edith who looked like she had been on the turps all night, all animoo’s were ready for show day - and this show day we rocked!!! We were again the only highlands in the classes in the last 2-3 years. 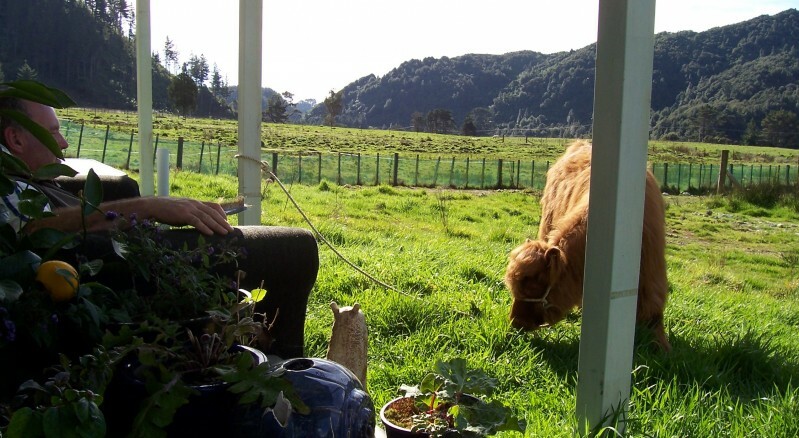 Edith did very well for her first time in this environment but was passed over in her class for cows with calf at foot, it was a big class so not really that surprising, but the experience she gained would be priceless. The 2 steers came in 2nd and 3rd which was great training and experience for them as they are off to a pet home together. Etta came in 1st and then on to win Champion Female beating the cow with calf at foot! – no mean feat for a yearling. Monty came 1st and then went on to win champion Male against a pretty muscly bull, which really threw us. Now onto the cup! We walked into the ring for judging my mum took Monty and I took Etta James and I was standing looking around thinking where are the others – duh the cup was Woolly Manor Moos vs Woolly Manor Moos! Etta won Champion Animal in Show and Monty Won Reserve of Show. It was also great to have Etta and Edith’s Breeder who have bred some outstanding Highlands over the years, able to come and watch the last of their progeny in the ring, so I hope we did them proud. Once again, the atmosphere was fantastic, People were really welcoming, organisation and facilities are great and another show I highly recommend people give a try. Two weeks later and it’s off on another 3-hour drive to Dannevirke. We have been really lucky with the weather as it has rained every single day except the days of show and this was no exception. This time I only took Etta James, Edith and Monty – yep he’s still on the bottle! I’m not going to go on about this show, we did really well Edith got not only her first bath but also her first ribbon – she placed 1st in her class, Etta got 1st in class and Monty got 2nd. This is a show I would definitely say is not for the Novice or faint of heart. We had been invited to show here at Clareville and the steward was great, but the facilities were cramped at best and somewhat dangerous – some stalls had up to 4 animoo’s in them. I learnt that Cattle have not been back showing at Dannevirke for very long after a drought of several years, and this year was the first in many years the Dry Stock Dairy section was back. Hopefully in the future the entire area that was originally built for the cattle will once again be used for cattle and not shared with horses that have their own area, we also had to run a gauntlet to the grandstand through the horse warm up area for the cup, and I will say if it wasn’t for our handling abilities and the help of a very nice Lowline Angus breeder (the one with cow and calf at foot from Levin) you probably would have been reading about it in the news! 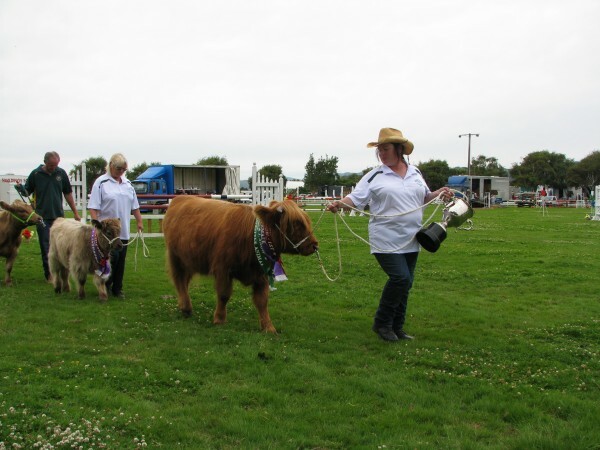 Next was the Grand Finale of our show season – Masterton. So once again Edith, Etta and Bottle bub Monty walk onto the magic box and 3 hours later walk off in a completely different place. We decided not to use the friends paddock the night before this time (Masterton is only 10 minutes away from Clareville) as the animoo’s really need the actual show environment to fully calm down. As with every show this season it rained consistently in the days leading up. The car and float was packed on Thursday with two tonne’s of “essentials”, and Friday morning we loaded Edith, Etta & Monty and hit the road. We arrived in Masterton around 2pm to torrential rain, but our designated stalls were high and dry so the unloading and bathing began. We had a great night with a few other breeders of various cattle (once again we were the only Highlands) and it was becoming quite social. We weren’t as socially organised as the Dairy section – they had Microwaves, fridge, toasters, BBQ’s someone even brought a lounge suite!!! But we were doing quite well with our fold out chairs, cheese, crackers and drinks. The Day of the show was warm and still raining (Wings over Wairapa had been cancelled for the day), but our spirits were high. The girls had sweated all night in the muggy conditions and getting them prepped was impossible – I would spend a ½ hour drying to come back 10 minutes later to a dripping wet animal! So in the end I did the best I could, we were there to get highlands seen and have fun after all. We did really well with Edith coming 3rd against cows with calf at foot, Monty came second to an unusual Italian Breed that I can’t pronounce let alone spell and Etta coming 1st and Reserve. Masterton is definitely another show I highly recommend not just in Facilities but also organisation and atmosphere. The highlight for me though was the Beef and Wool cup. At Judge’s discretion, we were asked to pick an animal to contend, along with some of the other winners of the lifestyle classes. 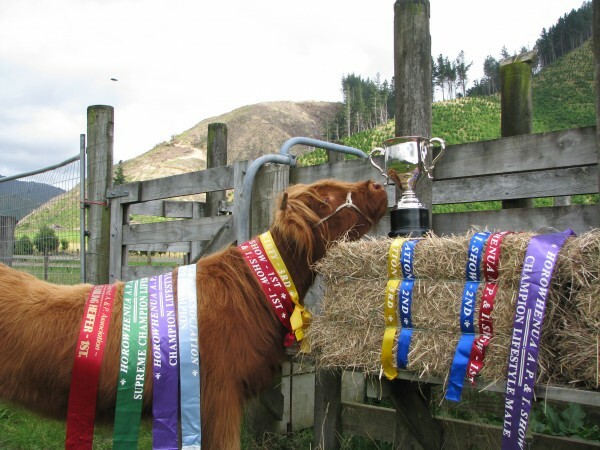 The cup challenge was to be one RAS registered representative of each breed. I chose Edith as the more experience she had the better (she will have calf at foot next year which will be a whole different ball game for a first time mum). A new Judge was brought in to judge the Beef and Wool cup, he was from a family that had been running and showing beef for over some 150 years and you could tell this guy really knew his Beef (this took us from our Lifestyle class into mainstream Beef). With around 20 animals in the ring (the largest contingency in years) he proceeded to pull out animals here and there – we were second pulled out, much to my surprise as there is no way it would be game over for us if the Charolais was pulled out first!. Now there was 12 of us lined up (and not another single lifestyle animal had been chosen). The Judge walked down the line and explained to the crowd (which had swelled to 3-4 deep by this point) about each breed, and he was very complementary about our Highland. The cup was won by a Gelbvieh, but that didn’t stop my pride in my animals after the Judges comments, even if Edith by this stage was so tired she fell asleep in the ring – yes nose on the ground! 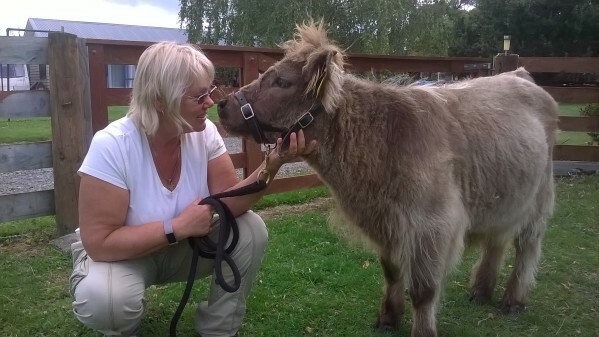 So with the show season now at an end for us (there are still other shows going on around the country), Etta and Edith now get to be “cows in a paddock” for a few months instead of “show ponies” and Monty will shortly be going to his new forever home. We have had a blast both in and out of the show ring and met some amazing people and breeders along the way. We have learnt a lot both good and bad, but that’s for another day. I really do encourage our members to have a go at showing at your local show next season. The entry fees aren’t high – usually around $10 per animoo and it really is a lot of fun and is a great experience for both young and old. If you want any advice, help or assistance and you’re in my area let me know we are more than willing to help. Just give us a call on 0278 333 000 and we'll be happy to answer any questions you have.